The majority of Americans will suffer a traumatic event at least once in their lifetimes, but not everyone will develop a serious mental health condition known as post-traumatic stress disorder (PTSD). While symptoms of stress, sadness, and shock may be common responses in the immediate aftermath of trauma, PTSD symptoms continue for longer periods of time and interfere with your daily activities. Intrusive memories of the trauma. Avoidance of the traumatic event or anything that reminds you of it. Triggers that can cause symptoms to arise include anything sensory— such as sights, sounds, or smells—that remind you of the initial traumatic event. 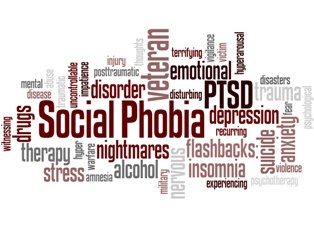 If you have been diagnosed with PTSD then you may qualify for Social Security disability benefits if you meet the requirements of Section12.15 in the Blue Book Listing of Impairments or if you otherwise qualify for benefits. Exposure to actual or threatened death, serious injury, or violence. Subsequent involuntary re-experiencing of the traumatic event (this may be intrusive memories, dreams, or flashbacks, for example). Avoidance of external reminders of the event. Disturbance in mood or behavior. Increases in arousal and reactivity (this includes exaggerated start responses and sleep disturbances). You must have an extreme limitation of one, or a marked limitation of two, of the following areas of mental functioning: (1) understanding, remembering, or applying information; (2) interacting with others; (3) concentrating, persisting, or maintaining pace; or (4) adapting or managing yourself. Your PTSD must be serious and persistent. That means that you have a medically documented history of PTSD over a period of at least two years and there is evidence of: (1) medical treatment, mental health therapy, psychosocial support, or a highly structured setting that is ongoing and that diminishes the symptoms and signs of your mental disorder; and (2) marginal adjustment or minimal capacity to adapt to changes in your environment or to demands that are not already part of your daily life. If you can’t meet these exact requirements then you will not qualify for Social Security disability pursuant to Section 12.15. Your symptoms are at least equal in severity to another listing in the Blue Book. You lack the functional capacity to work. In other words, your PTSD prevents you from holding down a job that is considered substantial gainful activity. Remember, you only need to qualify for Social Security disability in one way in order to receive benefits. Date (if single incident) or timeframe (if multiple or long-term trauma) of the original traumatic event. What is the catalyst for your PTSD? What happened that caused such anxiety? Dates and results of doctor appointments. What symptoms are documented? What kind of treatment have you received (medication, therapy)? Dates and effects of workplace episodes. Incidents where you tried to work, but symptoms caused you to have to leave, be fired, or quit. Dates and reasons for missed days of work. When absences are related to your condition, you should document this. Coworker and employer accounts of how you act or acted at work. Were your symptoms gradual or did they escalate quickly? Were you unable to perform your duties? Were others forced to pick up your slack? Identifiable triggers. What do you think causes your episodes? Frequency of episodes. How often do you experience episodes? Once a month? Once a week? Multiple times a week? Contact our office today to see how Keefe Disability Law can help you build or rebuild a strong disability claim that will adequately convince the Social Security Administration that you have PTSD and that it has affected your ability to sustain gainful employment. You have suffered enough—allow us to provide you with the resources, guidance, and support you need to pursue a successful disability claim.